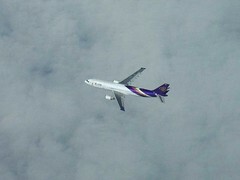 A Thai Airways' Airbus 300-600 en route from Beijing to Bangkok on Feb 27th, 2008. This was shot mid-air over China airspace around Nanning. I was at 11,600 meters (38,100 feet) and they were at 11,000 meters (36,100 feet). We were both heading for Bangkok's Suvarnabhumi airport (I was back from Shanghai). The newly implemented China RVSM airspace made it possible to spot closer at aircrafts on cruise in the same direction. I really like to travel, although I am very afraid to fly. Therefore, during the flights, I always try to sleep. My last trip was into Thailand, I also slept the whole flight. But then, when I got to go in Chiang Mai, I was in a great mood. First of all, after I settled in the hotel, I rented a scooter http://catmotors.net/our-motorbikes/, and went to the mountains. There's a lovely fresh air and beautiful views!